* alias for it (which e.g. makes u-boot set a mac-address). I refered to the dts file of orangepi-zero-plus2 whose mmc1 got a ap6212 chip too. After i changed it, I compile the new image and burned to the sd card and boot, but the wifi does not work at all. it succeed with no output, but i got nothing when i ran the command "dmesg | grep brcmfmac"
Did I write the dts file wrong? or something else? Any advice is much appreciated, Thank you! Do you have any schematic how you wired the ap6212 ? Where did you connect WL_REG_ON, is it on PL7 ? What do you have by doing "dmesg | grep -i mmc" and "dmesg | grep -i sdio" ? yes, i wired WL_REG_ON of ap6212a chip to PL7 of H3. I got the following content while running "dmesg | grep -i mmc"
[    2.831268] mmc0: Problem switching card into high-speed mode! and i got nothing while running "dmesg | grep -i sdio", the attachment dmesg.log contains the whole output. And finally, the schematic.png illustrates the connection between H3 and ap6212a. This part of the log tell us that your eMMC is connected to mm1 instead of mmc2, so there is a conflict here in your DT. 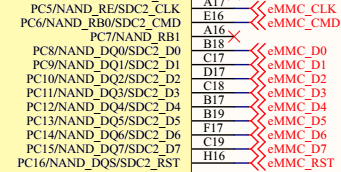 But, I did wire eMMC on MMC2 and ap6212a on MMC1, as the schematic shown below, and the eMMC works fine right now, but the ap6212a is not detected by armbian. eMMC works fine right now, but the ap6212a is not detected by armbian. As I said earlier, I'm questioning why your eMMC is seen as mmc1 in your log. Please, provide the part of your DTS which describe mmc0/mmc1/mmc2 to make sure nothing is wrong there. and, after being compiled, the output of dtb decompiled to dts can be found in the attachment. Any advice on the dts file? Thank you for your patience! Any advice on the dts file? Try to move the "wifi_pwrseq" node outside the mmc1 node, normally it should be located nearby the "vcc5v0" node at the same level of indentation. [    2.831765] mmc0: Problem switching card into high-speed mode! as shown above, "sunxi-mmc 1c10000.mmc" allocated mmc-pwrseq, and is initialized. but there's no any output if i ran the command "dmesg | grep -i sdio", still no "high speed sdio card" recognized. Maybe you can try to take the OPiZeroPlus2-H3 DTB and overwrite it to see if it more recognized ? BTW, since it is you own hardware design, did you provide a 26MHz crystal between AP_XI and AP_XO ? Aha, it turns out to be my hardware failure: I connected a triode and an LED on the wl_reg_on, trying to use which to indicate the wl_reg_on is on. But at the same time, the triode and LED makes the wl_reg_on is always low. I solder them off, and ap6212 works fine now. By the way, my sdio wifi is still recognized as mmc2. I bought a orangepi zero plus 2 a few days ago, and it recognized sdio wifi as mmc2 too. Much sorry for my hardware mistake and much thanks for your patience and help!